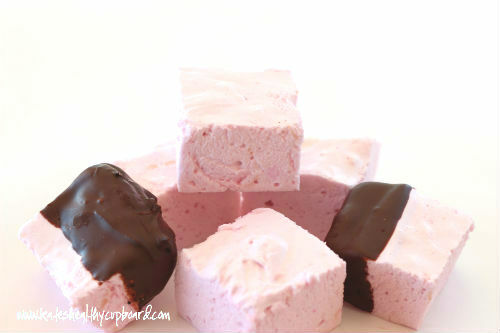 So excited to bring you this fun Valentine's Day Marshmallow Recipe. I can't really take credit for it...only the pink part and chocolate dipping is my creation. The best part is that these are naturally colored with beet juice. The credit goes to Adrienne over at Whole New Mom. Her website it full of great recipes, DIY remedies, lotions and potions. Go check her blog out!!! This recipe calls for liquid sweetener and I have not been able to find anything that works in recipes to replace honey, syrup or corn syrup with no sugar. Adrienne has the answer...vegetable glycerin!! We have all heard that you shouldn't put anything on your skin that you wouldn't put in your mouth. Well vegetable glycerin is often times found in skin care as a natural preservative, but also has a bit of sweetness to it and is completely food grade. What the heck is vegetable glycerin? Glycerin is widely used in the food industry for two main reasons: it has a sweet taste, but has fewer calories than sugar; and it is hygroscopic, that is, it absorbs moisture from the air. It is therefore used both to sweeten foods and to keep them moist. The compound is metabolized more slowly than sucrose— the type of sugar most commonly found in candy and in processed foods — and therefore does not have such a dramatic effect on blood sugar levels. It also does not contribute to bacterial tooth decay. Foods marketed as being low in carbohydrates are often sweetened with glycerin. Another major use is in the cosmetics industry. Due to its hygroscopic properties, it is used in many moisturizing skin products, as it seems to help relieve dry skin problems by drawing water up from the lower layers. It is also a component of glycerin soap, which is often used by people with sensitive skin. Lotions containing this compound are also popular. I did some research to find a source of vegetable glycerine that was from coconut and/or palm oils, not soy oil. I think the best source is from Wilderness Family Naturals. They are a trusted company with great products (I have no affiliation)!!! You can also use Now Foods Vegetable Glycerin that I believe to be a reputable source as well. The Now Brand can be found in many local health food stores and possibly Whole Foods. It is sold in the lotion section since many people add it to their homemade lotions. Warm the water on low heat to get the beets to bleed. You want really pink/red water. Once you blend this with the gelatin and other ingredients, it really lightens up. With a hand mixer or standup mixer, start beating the gelatin and beet water as you slowly add in the hot sweeteners. As Adrienne suggests, you can roll marshmallows in coconut, cocoa, nuts or any other topping.